The Royals Wedding We've Been Waiting for Is Here, But Will Willow Be Strong Enough to Take Down the Monarchy? 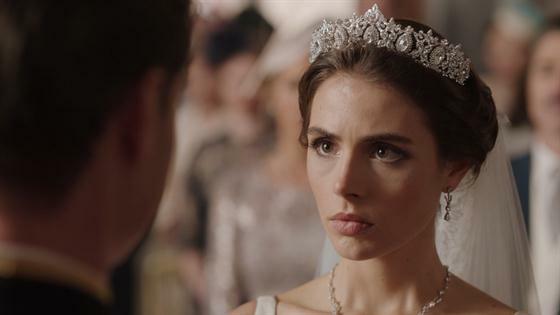 It's the season finale of The Royals and the wedding we've all been waiting for is here—no, not Prince Harry and Meghan Markleour very own TV royals King Robert (Max Brown) and his beloved Willow (Genevieve Gaunt). Up until now, it seemed like the couple was very much in love and ready to take on the monarchy together, but after Princess Eleanor (Alexandra Park) warned Willow that Robert wasn't to be trusted, their royal matrimony fell into question. Willow's feelings aside, there was still a coup underway and that meant everything had to go according to plan! "Eleanor: You continue designing the wedding. Liam: All your best man obligations. Bodyguard: Security. Cyrus: Fondle the help. Everything as it's always been. Do not slip up," Queen Helena (Elizabeth Hurley) instructed the coup crew. While the rest of the family was going for a more subtle approach, Willow decided to take her concerns to her future husband. "I know you caused the blackout," Willow told Robert. "Who told you that?" Robert snapped back. Instead of ratting out Eleanor, Willow insisted that she came to the conclusion on her own. "You were upset with me after I gave that interview, the one about Martin Kane. It bothered me, so I did some soul searching and connected the dots," Willow revealed. It wasn't just the damage the blackout caused that concerned Willow, it was Robert's tyrannical takeover that gave her pre-wedding cold feet. "Parliament exists for a reason!" a frustrated Willow yelled. "One person shouldn't hold all the power, it's too tyrannical. History bares that out." "I'm not concerned about history. Parliament was a sham, full of corruption and greed," Robert insisted. Worried that the country had lost its way, Robert stood by his vision and his leadership despite Willow's concerns. But it was those very concerns that were keeping her from walking down the aisle. "I can't marry your son," Willow told Helena with tears in her eyes. "I'm sorry. He needs to be stopped." And she was willing to do whatever it took to end his rule, even if that meant exposing Robert during their wedding. "I could expose him," Willow offered. "In front of the world, during my vows. I could tell the world what he's done and who he's been." 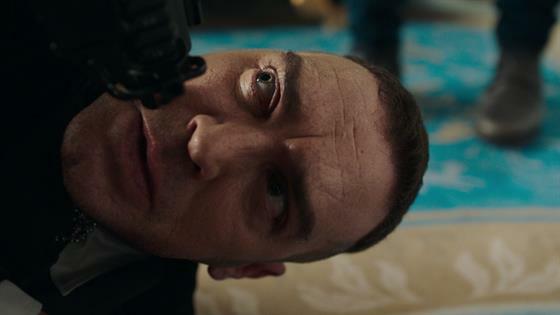 With everyone on board and a master plan in place, Jasper (Tom Austen) sought the help of the king's security head James Hill (Rocky Marshall) to take Robert down if things get out of hand, but when he refused, Jasper turned to a more reliable adversary. "How would you like to overthrow the current king of England?" Jasper asked Brandon Boone (Thomas Christian). "I've already killed the man once, I'm more than happy to do it again," Boone replied. 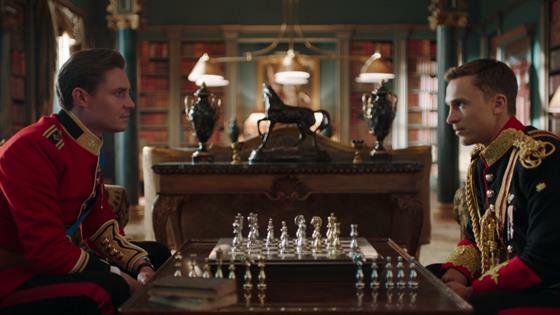 In keeping to plan, Liam (William Moseley) visited Robert hours before his nuptials for a game of chess and a little brotherly advice. "Dad wanted to disband the monarchy because he understood how that kind of power can corrupt even the best of us," Liam explained. Though there was a game at play, it wasn't competition Liam was there for. "I didn't come here to compete with you. I just wanted to spend a few minutes with my brother, remind him that I love him and tell him that when he was at his best, no one loved him or appreciated him more than I did," he said before leaving the room. With emotions running high, it looked like Liam might get cold feet too. "I feel terrible about all this. I really do," Liam confessed to Eleanor. "Mostly for you." "Why me?" Eleanor asked. "You shouldn't have to lose your big brother in all this," Liam insisted. "I have a big brother, damn good one. I'm sorry I didn't believe you," Eleanor apologized. Despite the family's mixed emotions, it was time to face the music and get this coup...we mean wedding, started! But there was no coup. Instead, the pair exchanged the traditional "I dos" and left us at the altar. So what's next for our favorite royals? We'll just have to wait and see! See all the jaw-dropping moments from the season finale in the recap video above.